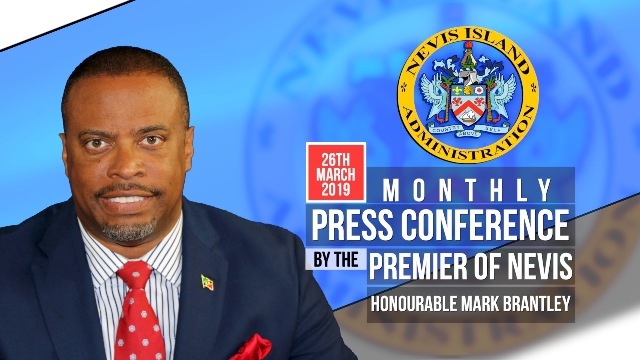 NIA CHARLESTOWN NEVIS (March 19, 2019) – All media houses and members of the press corps are cordially invited to the monthly press conference, hosted by Hon. Mark Brantley, Premier of Nevis, on Tuesday 26th March, 2019. The event will commence at 10:00 a.m. at the Cabinet Room on the 2nd Floor of the Social Security Building at Pinney’s Estate. At the press conference, Premier Brantley will provide an update on matters of national interest. Members of the press will have the opportunity to ask questions. The press conference will be broadcasted live on the Nevis Island Administration’s Nevis Television (NTv) Channel 99, NevisTvOnline.com, NTv Go App, NTv Facebook page and NTv YouTube page. It will also be available on THG Network, Voice of Nevis (VON) Radio and Freedom FM.